Building a new roof is such an exciting phase. After months or years of planning and saving for it, it’s finally happening! But wait… are you 100% ready for this? Take note that this is a long-term commitment and a major investment. There are critical decision makings as well. 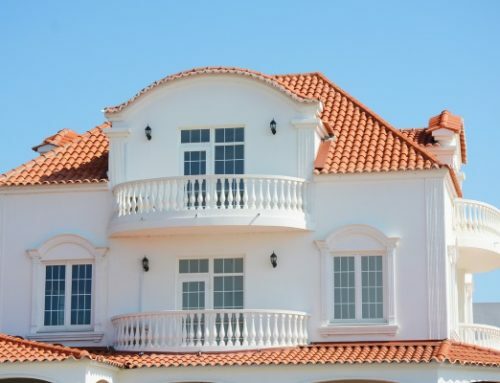 Do you want a traditional but classic type of roof? Or do you want a modern-looking one? You have to be sure about the steps you take. Don’t worry because in this blog entry, we’ll share useful insights on residential flat roof construction and why it’s a great choice. Related: Why Are Flat Roofs Common on Commercial Buildings? 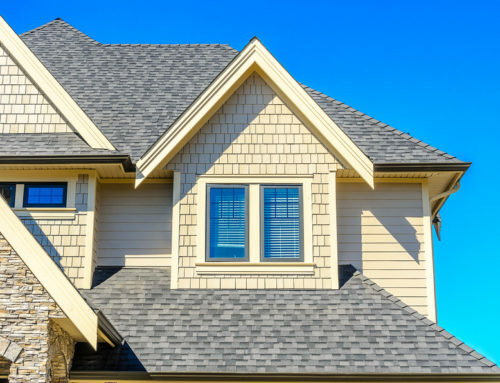 Historically, homeowners are more partial to sloped or pitched roofs. 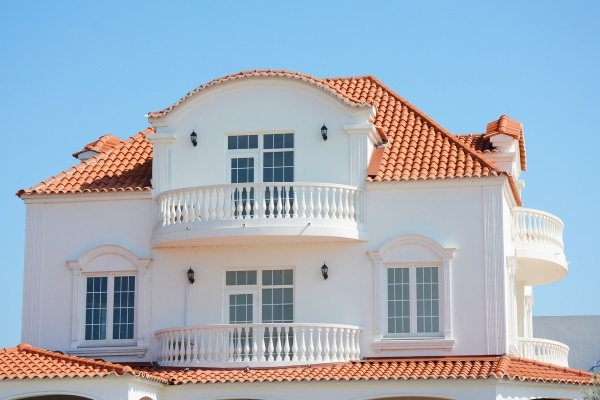 They associate residential properties with these types of roofing styles. In fact, there are different variations that they can choose from. However, as time passes by, a non-traditional type of roofing has emerged in the form of residential flat roof construction. Initially, these are concentrated on commercial and industrial buildings for various purposes. Now, they are already seen in neighborhoods to exude that minimalist and modern appeal. Without further ado, here are the benefits and downsides of a residential flat roof construction. 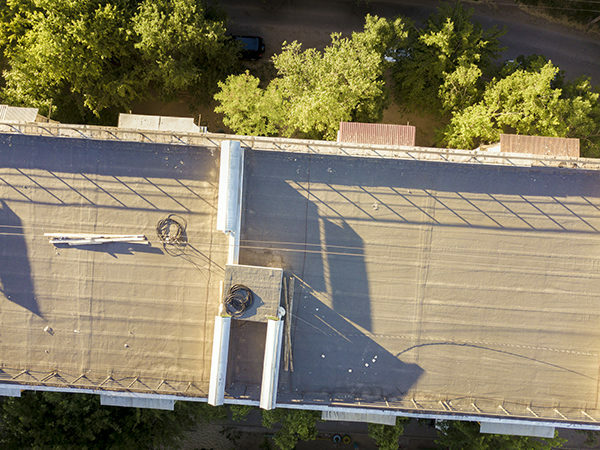 Business owners are drawn to flat roofs because they are cost-effective. This may be the main reason why flat roofs are also penetrating the mainstream residential roofing industry. Flat roofs are not entirely flat. This is an example of a slight slope that drains water. As for residential use, there are other benefits that you can look into to see if this will align with your priorities, lifestyle, and long-term plans. You can literally walk on a flat roof which makes it easier and a lot safer to access. Pitched roofs, on the other hand, are tricky and complicated due to how it is constructed. There are slopes and angles to take into consideration if you or a roofer need to climb up the roof. In connection to flat roofs being more accessible, they are also low maintenance. Professional roofers can conduct inspections faster as they can immediately detect where the problem areas are. Thanks to its flat surface, it’s also easier to clean and repair as needed. Most residential flat roofing systems last for more than 30 years. They are not only long lasting but are also proven to be tough against external threats. Flat roof materials are also waterproof and extremely durable, hence, they have a proven track record in the commercial roofing industry. It’s also important to point out how its flat surface can offer less resistance to the wind as compared to sloped roofs. Flat roofs offer an added space that homeowners can transform into other useful purposes. Flat roofs offer added space that homeowners can transform into a functional area. Some people use it as storage while there are more creative options like a penthouse, rooftop view deck, patio, garden, solar panels, etc. The surface can accommodate extra weight without compromising its performance. 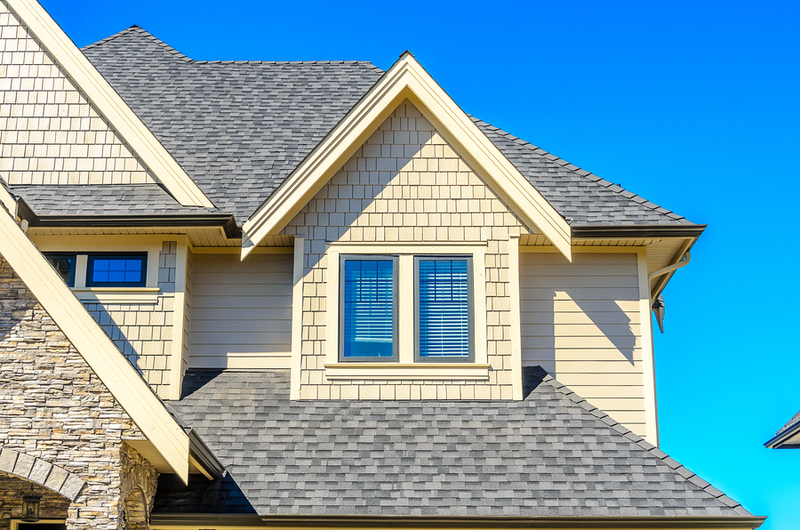 Every type of roofing has its own pros and cons. This is a non-negotiable fact that comes along with choosing a roofing design. Nothing is a hundred percent flawless because of their unique characteristics and features. Having said that, residential flat roofs also have their drawbacks that you need to be familiar with. At the end of the day, it is all about your willingness and capabilities to manage these downsides to make it a great match for you and your family. A pitched roof has a distinct and classic appeal that most homeowners would want to achieve. 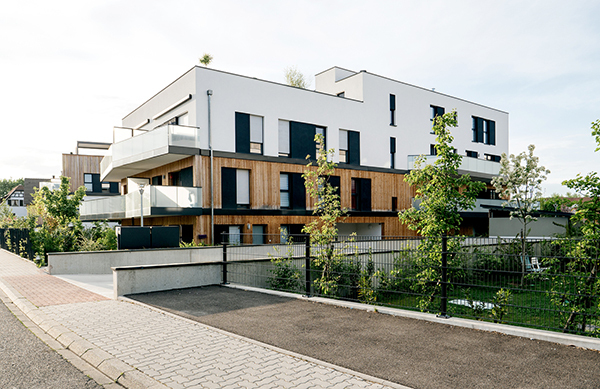 With a residential flat roof construction, the bespoke angles and slopes are significantly less. It appears to be flat and more minimalist in terms of design. Though there may be limitations when it comes to design, it doesn’t make it less of a good choice. The extra space it provides makes up for the lack of curb appeal. Furthermore, it targets a different modernized look which is also ideal for residential. 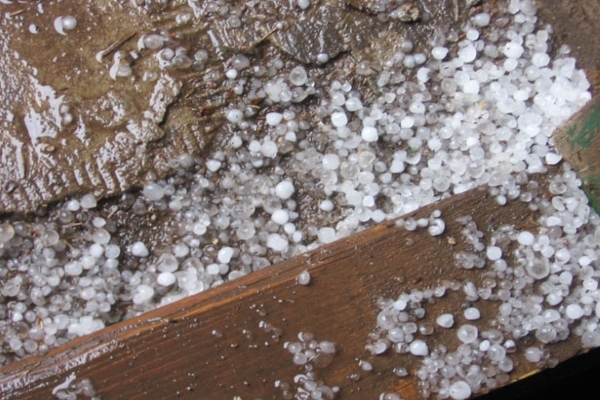 There are reports about flat roofs being prone to leakage due to its surface. While it’s true that there’s a tendency to pool water especially during heavy rainfall or snowstorms, there’s a solution. Low-slope roofing is not entirely flat for there are slight pitches to drain water and avoid leakage. As compared to normal pitched residential roofs, there is a relatively lesser area designated for insulation or ventilation. As a result, flat roofs may not effectively deflect heat that may penetrate the building. 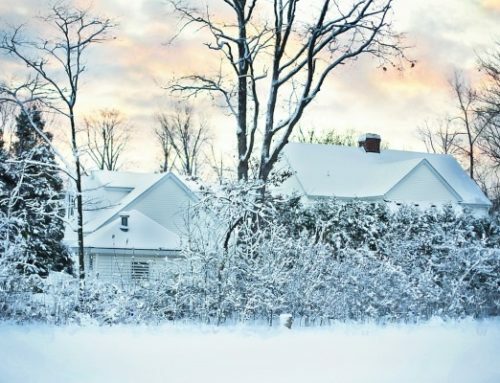 In response to this dilemma, some roofing contractors suggest roof coatings and other energy efficient materials that can cope up with heat absorption. Flat roof installation on a residential property. If you feel like you are caught up with too little options, we invite you to think again. Why? In reality, there are different types of flat roofing systems that you can consider for your future or existing residential properties. 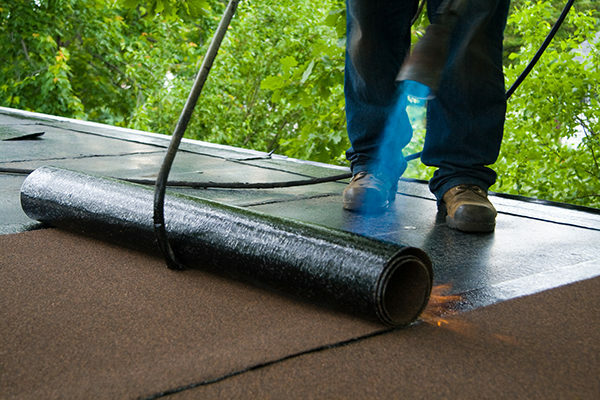 A built-up roof (BUR) is composed of tar, gravel, stone, and other waterproofing additives. It can last for up to 40 years if installed correctly. You can even extend its use provided that you will regularly have a professional roofer inspect and maintain the roofing. BUR is a good investment not only because they are long lasting but also due to its proven durability. One thing that you have to note about BUR is that it is heavy. Hence, the installation may take time affecting the labor costs as well. Mastic Asphalt is a moldable composition known for its durability, thus, many homeowners choose this roofing system over the others. However, installation is a clincher because the material is difficult to handle. Workers need to create reinforced joints to support MA during construction. The same thing with BUR, labor costs may blow up due to the complicated process. Modified bitumen entered the market as an alternative to plasticizers which are harmful to the environment. To increase its performance and durability, the base material is reinforced with additives like polymer and fiberglass. The two most common types of modified bitumen are the following: (1) SBS or styrene-butadiene-styrene which has an increased flexibility and stronger expansion and contraction capabilities, and (2) APP or atactic polypropylene which has an increased aging ability. Installation of a modified bitumen roofing material. 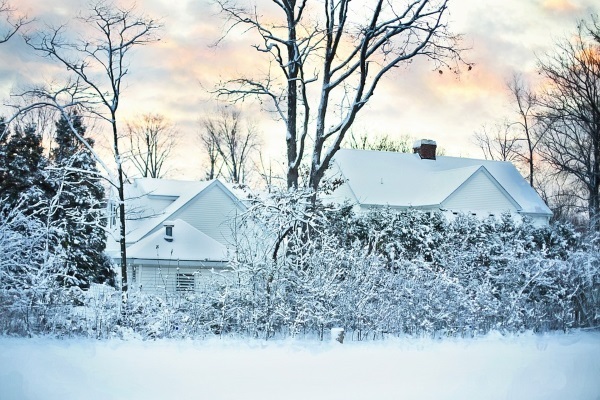 This single-ply roofing system can effectively withstand harsh weather conditions. They are also easy to repair in case of damages. EPDM is basically a rubber material. It is made from recycled strips of rubber that are bound together. Homeowners who want EPDM roofing should be mindful of potential leakage if the edges aren’t properly attached. 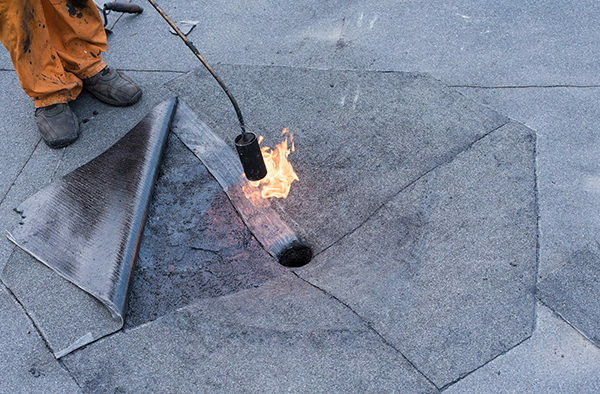 Hence, you should hire experienced and credible roofers to install a rubber flat roofing. One thing great about EPDM is that it is indeed long lasting. It can reach up to 50 years. Note as well that EPDM is waterproof and weather-resistant. 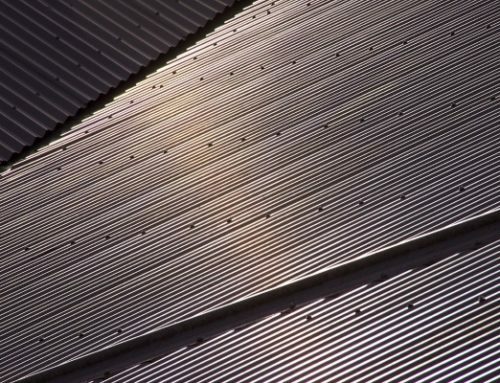 If you have the budget, you might want to consider metal flat roofing. It is in the higher price range due to good reasons. 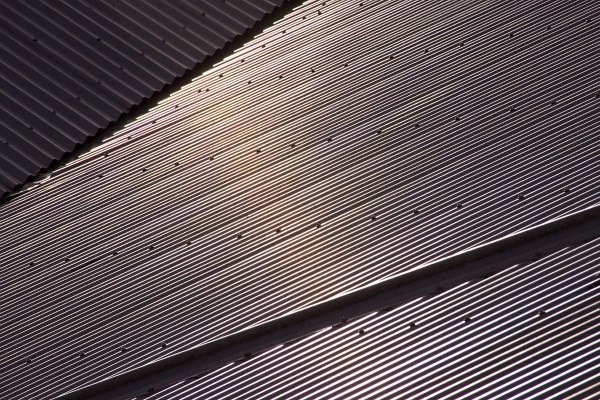 For one, metal roofing is versatile. There are different variations to choose from. There’s aluminum, steel, zinc, or copper. You can also choose from a wide range of color and finish selections. They are also priced higher due to the fact that they are chemical-free, lightweight, long lasting, and durable. If you live in areas prone to heavy storms or rains, the noise coming from the metal roofing may become a disadvantage. However, consider as well that it is fire-resistant which makes it ideal for homes. The decision will still come from you. However, it is also helpful to get insights from trusted local roofers. 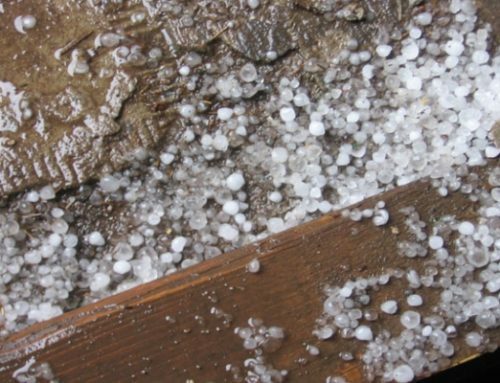 They can give you accurate information about how the weather conditions can impact a certain type of roofing – whether it’s pitched or not. If you want to venture into something that’s outside the tradition, then you can choose to have a residential flat roof construction. It may not be 100% perfect but you can weigh the pros and cons to see if it’s something that you want to deal with for a long period of time. Bonus tip: Do not rush your decision making. Think about your future plans. Consider your financial capabilities. Lastly, make sure you have a trusted roofing partner to give you the best recommendations. Find someone who can produce the best results that you deserve. Need more residential flat roof constructions tips? We have more to share! Get in touch with our roofing experts via 248-266-8773. 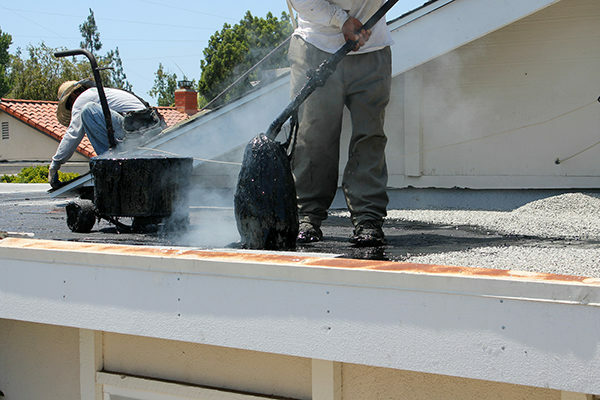 Most Common Flat Roofing Systems Workers installing tar, gravel, and asphalt on a flat roof installation on a residential property. EPDM coating is best for its protection. It’s really great that you suggested using steel, zinc, or copper metal for a really versatile, chemical-free, lightweight, and durable flat roofing that could easily last a lifetime. This is just the kind of commercial roofing option that my dad is looking for his downtown culture hub building complex. He wants a really tough metal roof to fortify the antique adobe shingles of the three-story, three-block property with something that is not only fireproof but also a good insulation material for his solar-powered enclave.